Assuming you’re reading Abnib in chronological order, you’re already aware that Claire and JTA split up a little while ago. I don’t think I’ve ever seen so mutual, so on-equal-terms, so amicable a breakup, ever. While Ruth and I sat on the beach and discussed how we’d need to be ready to provide support to them, they’d already got the talking parts out of the way and were having a game of Mario Party 8. That’s not to say that it hasn’t been emotionally draining for them: I’m sure it has. But from all accounts, it sounds like they made the right choice for them. And after they’d done whatever they needed to, they each got to go home with their other partner (me, in Claire’s case; Ruth in JTA’s) and a tub of ice-cream. Is there anything more equitable? 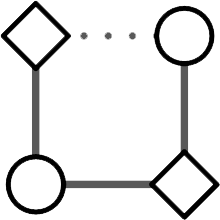 I suppose, of course, that this makes the four of us less like a “quad”, and more of a “U-shape” (remember the diagrams I drew way back when? – here they are again). Ruth and I are still doing fine, although this new structure gives us some fresh challenges. These challenges are all logistical in nature (over the last eight months or so, we’ve all gotten pretty good at dealing with the communication and emotional challenges we’ve come accross), and perhaps the biggest one has come from the fact that between the four of us, we only actually own two beds: when Ruth and I spend the night together, where do we put the “extra” person. So far, Claire and JTA have been very accomodating (and then some). Typically of late, one or both of them have been spending a night or two “away” per week, which has made planning easier, but in the long run, we’re probably going to need another bed somewhere. Space-constraints as they are, perhaps a folding one is a good idea. Or maybe we just need to put some effort into setting Claire or JTA with somebody else… can’t help but feel that’ll only add complexity in the long run, though, so I shan’t start playing “Haaaave you met JTA?” [YouTube] quite yet. Not quite yet. For the imminent future, there are bigger things to think about in the land of Dan’s Complicated Relationships. Ruth’s got a summer job in Oxford and since her driving test got cancelled she’s probably not going to be able to visit Aberystwyth as often as she’d planned to, so those of you who are still around will find both JTA and I missing her quite a lot for the next few months, I’m sure. When you look at the diagrams above, do you see JTA and I as the squares and Ruth and Claire as the circles, or the other way around, or neither? And why do you think that is? I’ve got a theory I’d like to test. You and JTA are the squares, though I’m afraid a bad case for your theory as my reason for thinking that is it correlates with the positions you occupied when I drew my diagram after I found out. I also thought of you and JTA as the squares. I don’t see the squares or the circles as representing anyone, particularly, they’re just placeholders for the structure. Even with the comments above, I still just see shapes. It’s probably my lack of imagination. Just to be awkward, I saw you and JTA as the diamonds. Agreed. Squares are traditionally more masculine than circles. Although in French they’re both masculine – except where circle means orbit or square means plaza. Then they’re feminine. Fun, huh? The first thing that came into my head when I heard was the phrase “tuning fork of death”. You have my permission to use it.